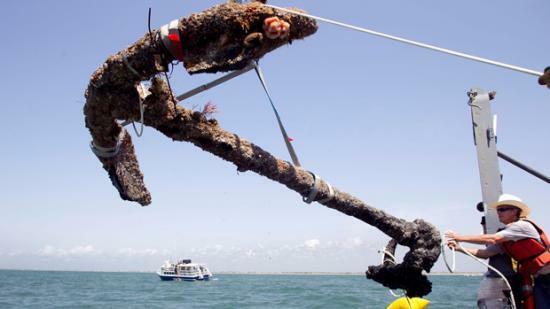 - USA – Morehead City - The tensest moment came as a hydraulic crane lifted the massive anchor from Blackbeard's flagship clear of the sea for the first time since the Queen Anne's Revenge sank nearly 300 years ago. The waves just off Atlantic Beach were a little too large, and dozens of researchers, state history officials and journalists watched, transfixed as crewmembers of the Research Vessel Dan Moore - two on ropes and one at the controls of the hydraulic lift - tried to stop the nearly 3,000-pound anchor from swinging out of control. The anchor was no longer a utilitarian item stowed away in the dank ship's hold by a crew of the 18th century's most hated lowlifes just in case they needed a spare. It was no longer a chunk of rusting iron gathering barnacles on the sea floor. This was the first of the ship's four large anchors to be brought ashore, and the largest item yet recovered from the wreck since its discovery in 1996. Visually, it was the most distinctive and recognizable item, with its artfully shaped flukes and a giant ring, big enough for a child to crawl through, where the anchor chain would have attached. Researchers have brought up tens of thousands of objects from the wreck, including several cannons, which required similar recovery techniques. On paper, such operations look as straightforward as hooking up a car to a tow truck and driving off. It's never that simple, though, at sea. They hope next week to dig a test hole from the side of the pile where the anchor was to get a sense of what they'll face when they excavate the pile. 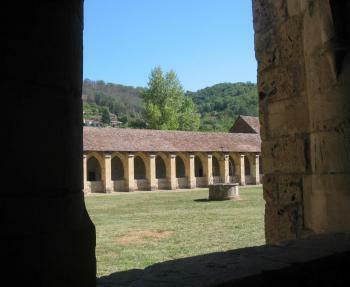 - FRANCE – Villefranche - Une partie du patrimoine peint de Villefranche sera présenté lors du colloque de la sociétés des lettres, sciences et arts de l'Aveyron qui se tiendra le mois prochain à Rodez (voir encadré) . Une conférence abordera même la série des Sept Sacrements installée aux cimaises de la chapelle Saint-Sauveur depuis 1749. Mais de récentes découvertes ont mises au jour une importante somme d'archives privées, lettres, bail à prix fait et autres documents permettant de retracer la saga de ces copies des œuvres de Nicolas Poussin réalisées par l'atelier Coypel- entre les XVIIe et XVIIIe siècles- Les recherches sur ses peintures continuent . Dernièrement, un décor peint a été mis en évidence sur une des portes de la Chartreuse. Marouflé sur les deux panneaux supérieurs de celle-ci, il représente une scène de chartreuse avec un père chartreux, peut-être Saint Bruno, ainsi que le monogramme de la Vierge et de Jésus. - USA – Fieldsboro - Only limited information exists on the history of White Hill Mansion, which has stood overlooking the Delaware River since the mid 1700’s. 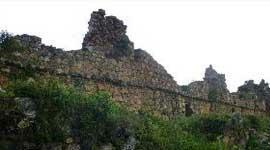 A group of archaeologists and volunteers are trying to uncover more. A six week dig on the grounds of the historic mansion is hoping to turn up more artifacts and clues on Mary Peel Field’s role during the American Revolutionary War and the existence of her mansion. - PEROU – Marcahuamachuco - Global Heritage Fund (GHF) will provide funds and technical experience to support scientific planning, cartography and archaeological conservation of the archaeological complex of Marcahuamachuco, located in the northern La Libertad region, Peru’s Culture Ministry reported. - ARGENTINE – Buenos Aires - A mummy and three skulls were seized by Argentine customs from a postal package from Bolivia that was labelled as containing replicas of Peruvian ceramics. The Fiscal Administration of the Public Income (AFIP), Argentina's tax authority, said in a statement Friday that the finding has 'major historical and archaeological value, since it belongs to the Paracas culture.' The Paracas lived between the 8th century BC and the 3rd century AD in what is now southern Peru. 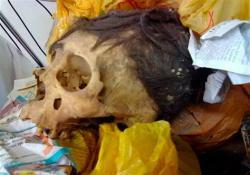 The mummy and the skulls were sent to archaeology experts for further evaluation. The parcel originated in La Paz and was addressed to an Argentine citizen in Buenos Aires. The priceless artifacts were believed to have as their intended destination European museums and private collections, the AFIP said. - AZERBAIDJAN – Goytepe - The Institute of Archaeology and Ethnography of the Azerbaijani National Academy of Sciences (ANAS) together with archaeologists of the Tokyo University will conduct excavations in the territory of ancient settlement Goytepe located in Tovuz region. The excavation will begin in June, ANAS told Trend. The Goytape settlement dates back to the Neolithic period. The archaeological excavations in Goytepe will be held within the State Program on Tourism Development in Azerbaijan in 2010-2014.